It's not a hobby, it's a lifestyle. A lifelong journey of self-learning and self-mastery. Classically trained, perfection driven, dancing for over 23 years. Cross training over the years has developed Crystal's own style of graceful and fluid fusion dance. Now training exclusively with her mentor, Rachel Brice, Crystal-Lynne has earned her Phase III 8 ElementsTMPractitioner's Certification in October 2016, as well as her Phase IV Datura Style Teacher's Certification in June 2017. 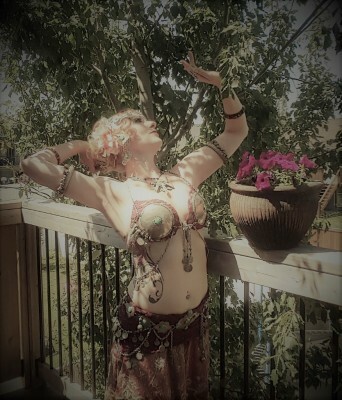 In 2014, Crystal opened her dance studio, Sultans Choice Belly Dance, in the heart of Red Deer, AB, where she runs a full schedule of dance classes in a range of fusion dance formats, as well as teaching workshops in and around Central Alberta. Crystal started her troupe, Harem, in fall of 2015. Now going into their third year, they look forward to working on more complex and detailed dance compositions, where they will display their craft at the annual Ritual of Dance next spring 2018. New in the 2017/2018 year, will be the advanced Fusion troupe, Increscent Fusion. For more information on booking Crystal-Lynne for a workshop or performance, or joining on of our two troupes, Harem (Oriental Fusion), or Increscent Fusion (NEW Advanced Fusion); please contact crystal@scbd.ca.